BANGKOK (Reuters) - The leader of a new party that has challenged Thailand's military government was charged on Saturday with sedition, the latest legal action facing the rising star after a disputed March election. Police told Reuters the complaint dates back to 2015, when Thanathorn, who was running his family's auto parts empire at the time, allegedly "provided assistance" to a leader of protesters against the 2014 military coup who violated a junta ban on gatherings of more than five people. As he left the police station, Thanathorn said the charges were politically motivated and questioned the timing: "Why does this come a week after the election?" "We believe in our innocence," he told reporters, declining to comment further on the case until he submits written testimony to police, which is due by May 15. "This isn't about me. This is about everyone who fights for justice," he told a sea of supporters outside. 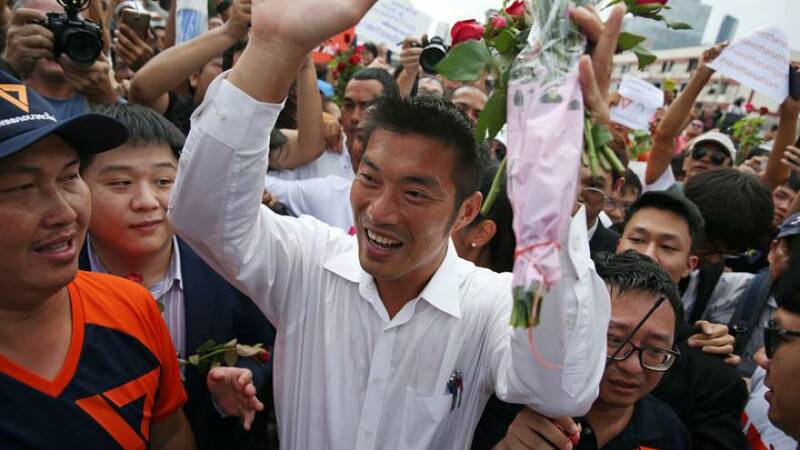 They handed him flowers and cheered loudly as he emerged from the station, chanting "Thanathorn, keep going!" Many wore orange clothing - the party's colour - and held up signs with "#SaveThanathorn", which is also a trending hashtag on Twitter.